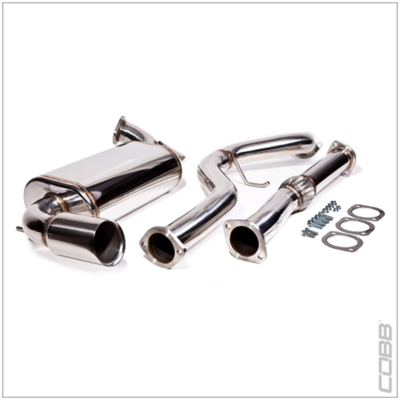 A perfect factory exhaust replacement, the COBB Tuning Cat Back Exhaust is engineered specifically to fit the unique rear bumper configuration of the 2008-2010 5 door Impreza WRX. The deep tone offers immediate audible satifaction, while at the same time offering easy installation by utilizing factory exhaust hanger locations. 304 stainless steel is used throughout the exhaust construction. All components are meticulously TIG welded for outstanding appearance and strength. The system is also designed to allow maximum ground clearance by tucking the 3” Stainless Steel piping up away from the ground, as much as possible. The 4“ polished tip sits perfectly in the OEM bumper cutout, yet is modest enough to not attract any unwanted visual attention. The COBB Cat Back continues to impress by sound testing well under the California SAE sound requirements! An unmatched exhaust note, easy installation, optimal performance, tasteful looks, and unparalleled durability .....its a tough combination to beat! Combine the COBB Tuning Cat Back Exhaust with the COBB Tuning Downpipe for a complete performance Turbo Back Exhaust that would then allow the use of their Stage 2 performance tuning via the AccessPORT!